Radon is not just odorless and colorless, it is wide-ranging and, next to tobacco, the leading cause of lung cancer. Left unattended to, it can also be bad business. So warns the leader of a Canadian company at the forefront of raising awareness and providing advanced technology measurement and mitigation solutions to deal with the naturally-occurring carcinogenic gas on both sides of the border. With his passion partially fueled by personal experience, Alan Whitehead, president of Vancouver-based Radon Environmental Management Corp., mentions an unpleasant situation facing the operators of former phosphate mines in central Florida’s Polk County. After closing the Poseidon Mine in 1982, the Drummond Company developed 1,400 acres into subdivisions to accommodate some of the nearly 1,000 people who move to Florida each day. Trouble is, phosphate mining can unleash cancer-causing gamma rays as well as radon, and on-site readings have revealed much higher levels of both health risks than at abutting properties. Whether Drummond should be culpable for negligence is for the federal court in Florida’s Middle District to hash out, as a class-action lawsuit was filed earlier this year on behalf of homeowners in two subdivisions. But whatever happens in the halls of justice, Whitehead says more such cases are inevitable as the dangers of radon become better known, and that builders and homebuyers alike would be well-advised to neutralize the risk at the outset. Their lungs, not to mention their businesses, may depend on it. A recognized leader in raising radon awareness and education in Canada, Radon Environmental has been a unique operation since its 2007 founding. “To my knowledge, we’re the only company anywhere that is entirely focused on preventing public exposure to radon gas, this is our core business,” Whitehead says during a long, lively interview from his downtown Vancouver office. Radon Environmental has mapped all of Canada for radon, finding some of the highest readings in densely populated areas not far from the U.S. border. Geoscience is the most important factor in radon presence, Whitehead says, explaining that uranium and thorium have been present in the earth’s crust since the formation of the planet. Common in Canada’s rocks, soil and groundwater, those elements moved with the glaciers into the United States over tens of thousands of years. Present to some degree in all buildings, radon levels depend on myriad factors, including, presence in water, uranium content of the ground beneath the foundation, underlying pathways in bedrock and soil for the gas to travel, building design and materials, and seasonal weather conditions. While the bad news is some radon is always indoors, the good news is it can be blocked during construction, and detected and mitigated in existing buildings. 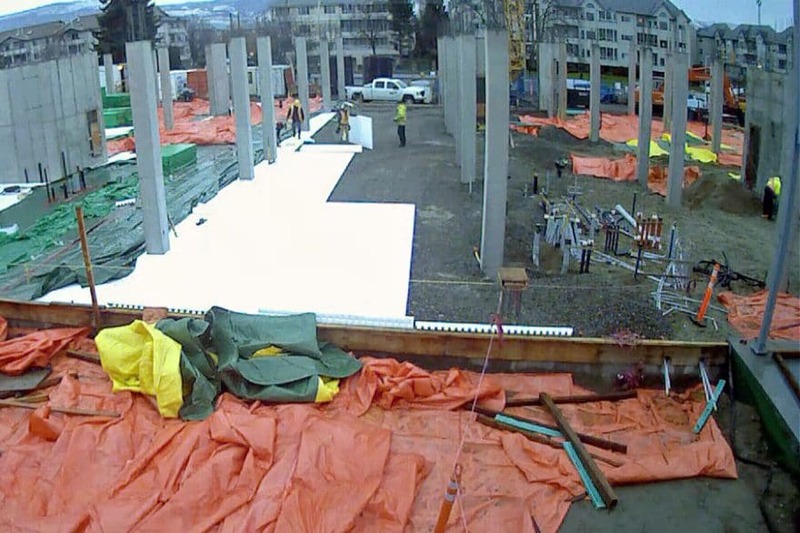 Among Radon Environmental’s solutions is Radon Guard, a structural, under-slab insulation and ventilation panel system that’s Canadian- and U.S. building code-compliant and, as a bonus, boosts LEED credits. Then there’s Radostat, a smart device the size of a smoke detector that can be placed in basements, which are most prone to radon. Upon detecting a high reading, the system activates ventilation. 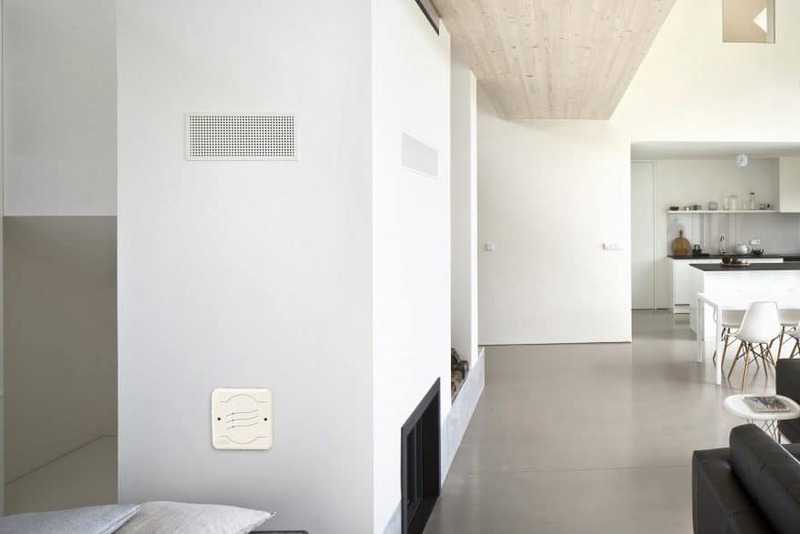 Radostat is also less invasive to building design and prioritizes energy efficiency along with good indoor air quality. And since groundwater may emit harmful gases through faucets, showerheads and toilets, Radon Environmental has partnered with an Ontario company, Airwell Technologies, to aerate wells with a low-voltage compressor that expels radon and other volatile gases, like methane. “If you’re on a well, and you have high indoor radon levels, 99 percent of the time your water will also be high in radon,” Whitehead says, adding that the risk isn’t from drinking, but from inhaling the gas. The same modern construction that provides for energy-efficient buildings can actually increase radon risk due to reduced air exchange, Whitehead warns. And while radon levels are most likely highest in the lower levels, the upper floors of tall structures don’t necessarily offer sanctuary. Air flow creates movement—the stack effect—that can make heavy gas rise up through stairwells and elevator shafts. Then there are the building materials. Whitehead tells of a seven-story Atlanta condominium with high radon levels throughout. The cause was finally found to be in the concrete walls that contained uranium-contaminated aggregate. The solution was installing air exchangers in the 300 units, lowering the radon levels below the EPA’s action level. For Whitehead, the mission of radon detection and mitigation grew somewhat naturally from previous positions in the chemical and mining industries in North America and Europe, where he established a reputation as a company builder. Declining attractive offers to relocate to the U.S. or Europe, Whitehead stayed in Western Canada, opting to apply his experience in what seemed an unfilled niche that combined business opportunity with a greater good. In the past decade, Radon Environmental has made itself heard, influencing Canadian building codes and stressing the need for testing and mitigation, not just in the home, but in schools and workplaces. 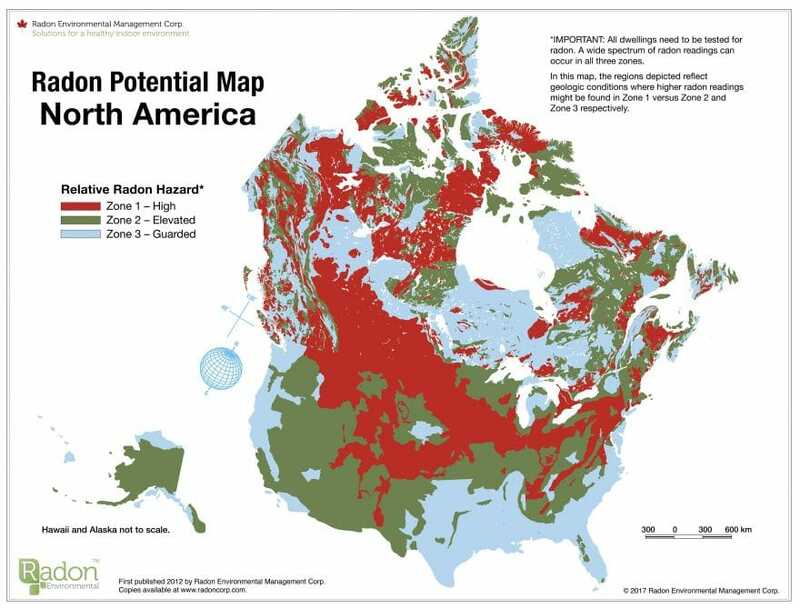 Having completed the first extensive geologic mapping of Canada, the company produced a continental map of North America and now offers radon mapping services to cities and municipalities. Radon Environmental will participate in Boston’s Greenbuild International Conference and Expo convention this November, and that’ll give Whitehead the chance to stress again how prevalent the gas is in the Northeast. He is encouraged that more and more U.S. states are opting for stringent radon testing and prevention measures for new and existing construction. In Canada, he also gets the word out through his role as a founding member and president of the Canadian Association of Radon Scientists and Technologists (CARST) and with the help of such celebrities as Mike Holmes, whose TV show “Holmes Inspection,” advises Canadians about renovation issues. Then there’s Whitehead’s role as a director of Cancer Survivors Against Radon (CanSAR), to which he has a very personal connection. When his family lived in Ottawa during the 1990s, Whitehead’s wife, Janet, ran an interior design business in their three-floor home. In 2011, long after the Whiteheads moved to British Columbia, Janet—a never-smoker—was diagnosed with lung cancer that forced the partial removal of her left lung and removal of tumors in her right lobes. Vividly detailing her illness on Radon Environmental’s website, Janet says the radon level in the Ottawa house was 85 picocuries or 20 times the EPA action guideline in the U.S. Reminded again of the radon risk in Canada’s capital region, the Whiteheads sent the occupants of their former house a radon detector that initially was thought to be faulty since the reading was so high. Subsequent tests by a radon professional validated the high levels, and—at the Whiteheads’ urging—the occupants hired a contractor to mitigate the problem and consulted with their doctor. To Alan Whitehead, it was one potentially troublesome situation solved, but with many, many more to go.